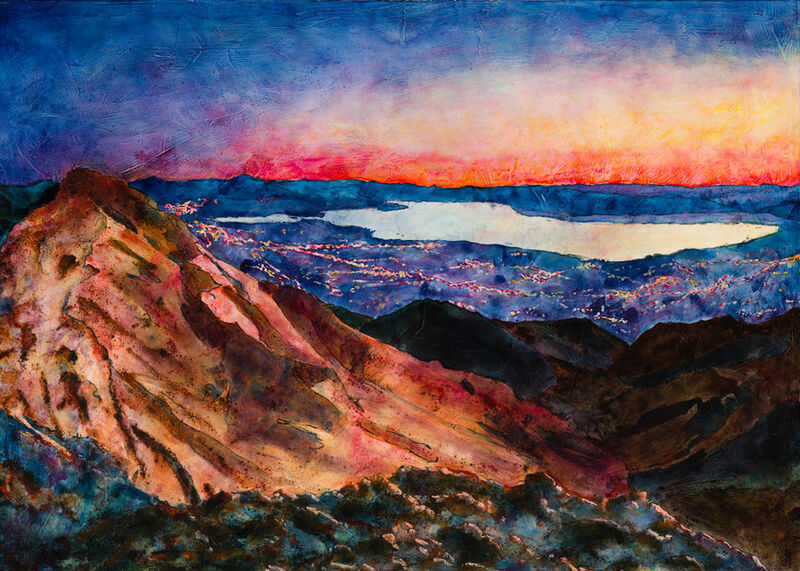 Aside from showing a different side of Timpanogos, Lindsay’s show presents the mountain through a different color palette. Colors pop — at one point in the discussion, Lindsay felt the need to stipulate that she doesn’t use neon, for example. Lindsay describes her technique, which combines watercolor techniques with acrylic and oil, as, in part, an attempt to preserve the vibrant colors of watercolor paints while they are still wet. She layers various chemicals and paints on top of her drawings, which sometimes peek through the final product. And she doesn’t ever use white paint.